After dipping in and out of it since October, I finally finished up Tiny Beautiful Things: Advice on Love and Life from Dear Sugar. 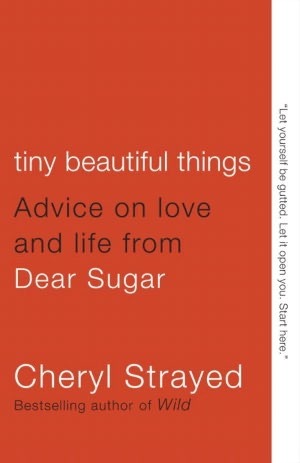 Made up of letters to and from The Rumpus's former advice columnist Sugar (AKA Cheryl Strayed), this book lends itself well to taking your sweet time (heh), reading a column or two every day, and letting the insights percolate. Sugar loads her responses with personal stories, and people seem to love or hate that with fairly little in between. Me? I'm firmly in the love camp. Strayed has been through hell and back herself, and her advice is often brutally honest, occasionally saccharine, but always 100% well-intentioned and given with love. This book is like being hugged by your best friend's cool mom over and over again. I've struggled to build boundaries with my immediate family (and my significant others, and my friends, and my colleagues...) for my entire life. I used to think that they were a sign of my own intolerance and inflexibility, but, as the quotation below beautifully illustrates, that's just what other people want you to think so that they can better push you beyond your limits, intentionally or not. What's harder, you can't just build these boundaries once. You keep building and fortifying them over your entire life. This is exhausting, but the payoff—your sanity, your peace of mind, and your self-respect—is worth all of the effort and more. Build up those walls and protect them fiercely. 2. Get on with it, because no one else will do it for you. Of course it's good to think about the ways things could have turned out differently. Reflection helps us to not make the same mistakes or find ourselves in the same situations in the future, but it's so easy to get mired in the muck of those slip-ups or the crappy, uncontrollable things that happen. Think on them, figure out what they have to teach you about how to move forward, and then get the eff moving. I know I'll be returning to this collection time and again, and I can't wait to see which letters stand out to me as I continue down this twisty, turn-y path of life. Have you read Tiny Beautiful Things? Which letters stood out the most to you?